I'm trying to get this in while the Activity Month theme is still 'time'. I have for you 2 mods today. They can work together or separately, but I do think they make a nice pair so they are together. The first is an aging mod, and the second is a school summer vacation mod. These both work nicely with my updated calendars, so be sure to check them out. Can someone please explain to me the rationale behind EAxis' weird default choices for age lengths? There are more than a few spots where it bugs the crap out of me, so I finally caved and decided to fix stuff. Everyone and their mother has an aging mod, so here's mine. First off, the toddlers. Four days is in no way long enough to learn the three basic skills not to mention Nursery Rhymes and regular skills, even with a stay at home parent. While I want to give them a few more days, I don't like the versions that double or triple toddler time because the little rugrats do get on my nerves after a while. So, I've added a few more days. After playtesting, six days feels like enough to get everything in and still have some time for playing on the side. 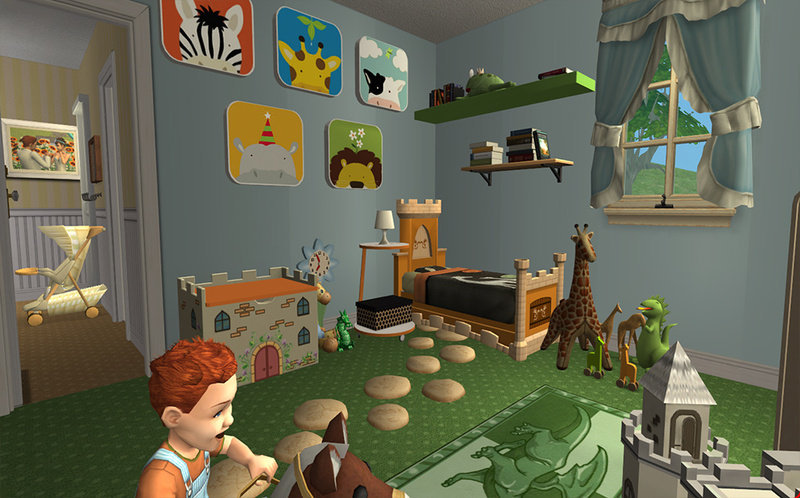 With the tots being tots just a little longer, I feel like I can invest in creating adorable nurseries for them now. Next up, kids and teens. Only eight days really isn't enough for my kids to be kids. They have one or two weeks at school and suddenly its off to more adult things like boys and spiting their parents. Whatever happened to hopscotch and make-believe? And why do teens have nearly double the amount of time that kids have? 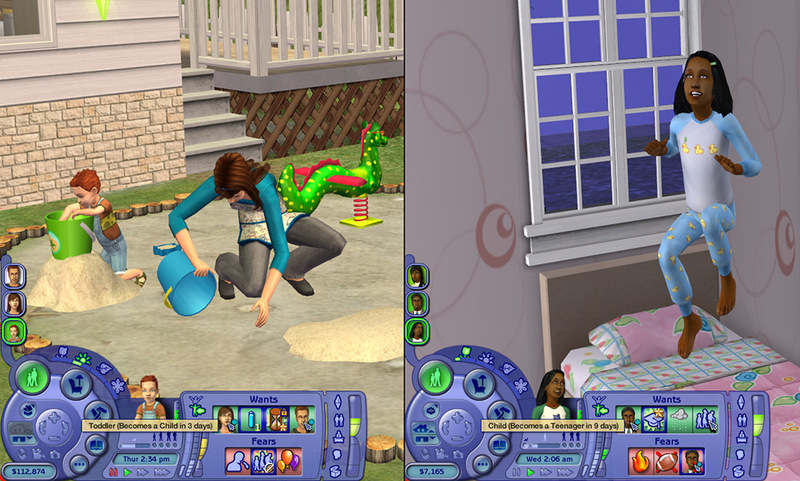 If mom and dad have a teen in the house and they pop out in a new kid, in the game, that new kid can age up to a teen before the original one leaves for college. How does that make any sense? In real life kids are kids from about 4ish to 12, and teens are teens from 12 to 20. Both are 8 years, so what gives? I've rebalanced it so both age groups have 12 days. 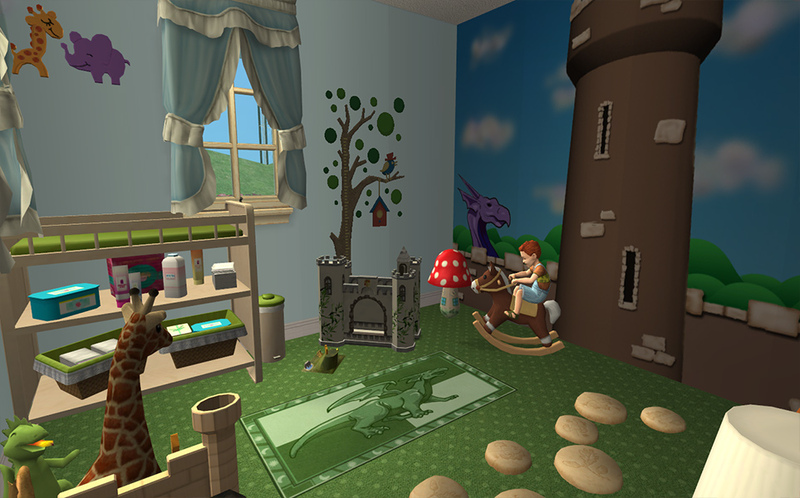 The great thing about the 12 days for kids comes in the next mod, so keep reading. The last annoyance was with the adults. 29 days just isn't enough. The only way that mom and dad can see their kids to college before they become old and slumpy is if they have only a few kids right after graduation themselves. The default time length was so short, I barely have any sims at that life stage right now, it's effectively turned my hoods into a southern Florida retirement community - definitely not what I was going for! >.< I prefer to give my newly minted adults a little time before tying them down with kids. Let them get up a few rungs on the job ladder, enjoy their hobbies and such. Kids are expensive! I originally tried upping it more than what you see here, but that was just too much time and they ended up topping out their careers while their kids were still toddlers. I'm pretty sure I have the balance correct now. As for the elders themselves, I think I might have shortened their span a bit. I've lowered the min range so that sims with bad lives can die of a heart attack at 50 and those blessed with happiness can live till they are 80. This mod also affects plantsims, but if you don't have seasons, it doesn't matter. Please note, this age mod (and most others) will not coincide with what inTeen is expecting for its fertility calculations. The adult life span is lengthened, so you might encounter oddities with having babies at the tail end of the agespan. 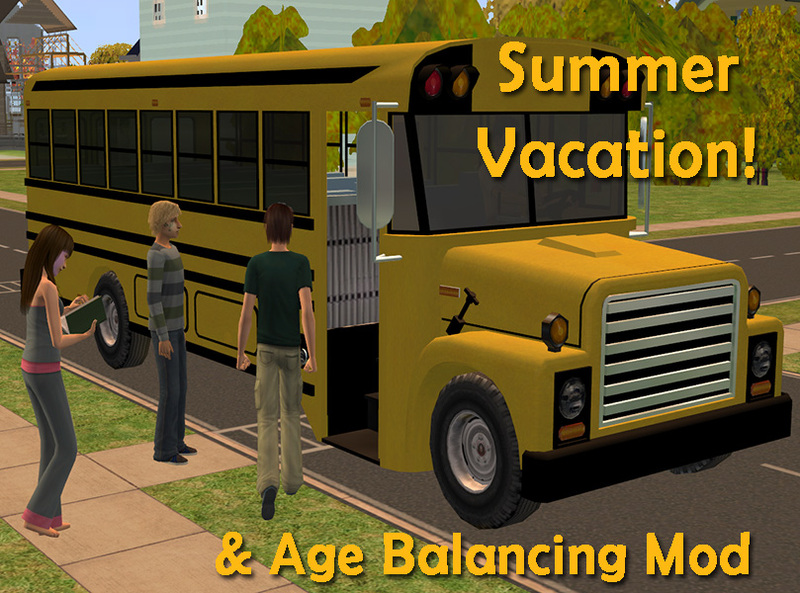 The second mod I have for you is a school summer vacation mod. I had downloaded one a while ago that let your kids have summer off, but it was based on the actual season, so in Strangetown kids had half the year off, and in Riverblossom they never got vacation. Then I found that this creator had made an alternative version based on the season quadrant instead of the season itself. This was lovely, except they only made it for quads 1 and 3. I personally like to play with my seasons and year set up Northern Hemisphere style - Spring/Summer/Fall/Winter. This means I need it for quad 2. So, I took to editing it myself and did just that. 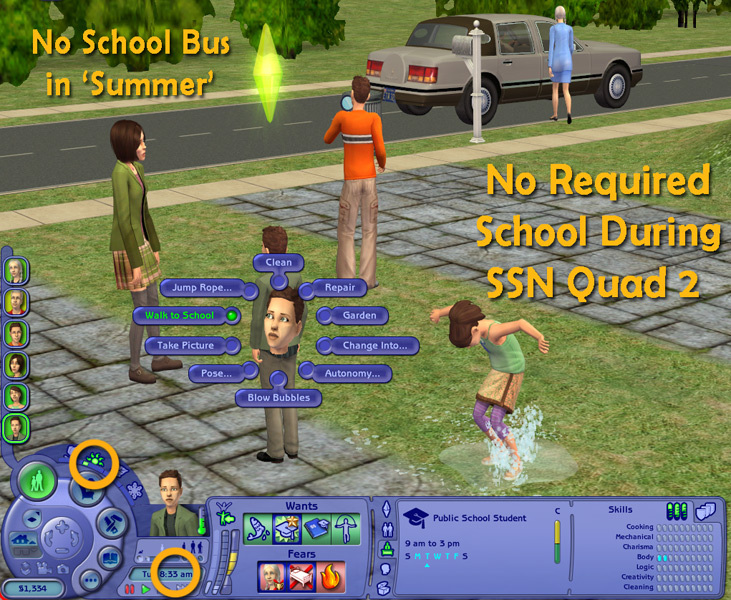 A fantastic little feature of this is that you can still direct your sims to go to school during summer. I've found that I send any child with lower than a B- to this 'summer school' to catch up on their grades, while the more scholarly ones can enjoy the warm weather. Now, I also wanted to give my little simmies a winter holiday free from school, so on the fourth day of winter they stay home. You can not direct sims to go to school on this day. This is Winter's Day. You may think of it as Christmas or Hanukkah or Kwanzaa or Yule or Winter Break an extra Snow Day or whatever else fits best into your story line. I think of it as Winter's Day and we celebrate with a decorated tree and give gifts and spend time with family. To use this most effectively, you will need to go through all your hoods and make sure that your 'years' are all set up the same, with the second season being the one that you want your kids home for, and the fourth season the one for 'Winter's Day'. It doesn't actually need to be winter during Winter's Day, ask our friends in Australia If there is sufficient demand for it, I'll make a Southern Hemisphere version with the school break following their schedules instead. Please also note that if you have InTeen, my summer vacation mod needs to load after it. Either put "zz_" on my mod's file name if they are in the same folder, or make sure inTeen's folder is alphabetically before the summer vacation mod's folder. There are two versions, one for those with BV and one for those without it. Please pick the correct one for your game setup. Well, that's about it. I hope everyone had a happy 2012 and I'm looking forward to an exciting 2013! poifectly_poiple for the original summer vacation mods. Also big thanks to jbeach34 and NixNivis for doing compatibility testing for me with InTeen. You two have made lots of people very happy!